Differences between setTimeout, setImmediate, and process.nextTick. A commonly misunderstood concept in Node.js is the difference between setTimeout, setImmediate, and process.nextTick. While all three functions are used to schedule the execution of a function, it is important to understand when Node.js will execute them. What do you think the order of output to stdout would be? The body of the script index.js will be executed synchronously as one block, scheduling callbacks to be executed later. The reason why I mention that is because none of the calls to setTimeout, setImmediate or process.nextTick will have their callbacks immediately executed within the same block as the main script. Screen capture of the Node.js Docs on "Event Loop, Timers, and process.nextTick". setTimeout - is scheduled in the timers phase for execution, though the execution will actually occur at the beginning of the poll phase. setImmediate - executes in the check phase when the poll phase becomes idle. The poll phase is where 99% of the callbacks in Node.js are executed. This means that setImmediate is delayed until the event queue is empty. process.nextTick - callback is enqueued in something called the nextTickQueue. This queue is drained (and executed) right after the current block finishes. When the queue is empty, control is returned back to the event loop. 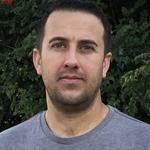 Entry script (index.js) code block executes. nextTickQueue is processed. process.nextTick had enqueued a callback, so that callback is executed. The timers phase detects a timer with a delay of 0ms has lapsed (from setTimeout). The callback is enqueued. The event loop enters the poll phase. The timer callback is dequeued and executed. The poll queue is empty and there are setImmediate callbacks scheduled; the event loop moves to the check phase. Event loop restarts. There are no timers or I/O operations pending. The process exits. When should I use each scheduling function? setTimeout - use this to schedule a function to be executed after a delay of more than zero milliseconds. If you need the function to be immediately executed after the active code block, use process.nextTick. If you don't need code to be immediately executed (allowing other callbacks to be invoked), use setImmediate. setImmediate - this is the preferred approach. Node.js recommends you use this instead of process.nextTick for all occasions!!!! This approach ensures the fair execution of code within the process, particularly I/O callbacks that will be waiting for the nextTickQueue to drain before they can be executed. 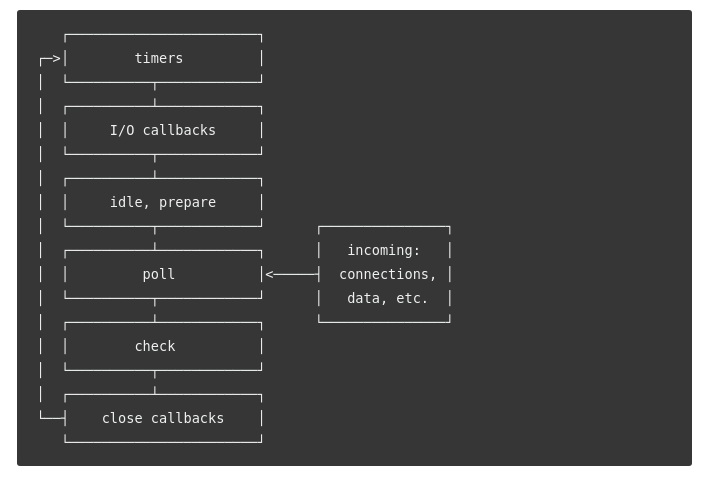 process.nextTick - ideal for situations when you want to ensure callbacks passed to a function are handled asynchronously, or you want to immediately return control of the thread to the caller, but do not want to wait for other callbacks to execute before the supplied callback. I don't know in what use cases this may be preferred to setImmediate, but it's an approach available to you. Finally, it is important to reiterate Node's warning about the use of process.nextTick. If you enqueue a large number of callbacks in the nextTickQueue, you can potentially starve the event loop by ensuring the poll phase is never reached. This is another reason why you should generally prefer setImmediate. It's extremely important to understand how the Node.js event loop works. As we saw in the example, it's possible to schedule functions expecting a certain order only to be surprised by what actually happens. The key takeaway is that 99% of the time you should be using setImmediate instead of process.nextTick or setTimeout(fn, 0) since both functions compete against waiting I/O callbacks and potentially starve the event loop.